You are ready to get into a compact car, and it is important that you look into the performance features of each model that you are considering. 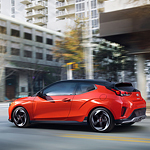 Hyundai of Somerset stays ready to share the performance features of the Hyundai Veloster with you so that you can see how this car can meet your needs. You are looking for a vehicle that gives you the power to steer well. You want the steering that you do to be accurate and you want the vehicle to respond well when you turn the wheel. The Hyundai Veloster is set up well when it comes to steering. If you are someone who likes to customize your driving experience each time that you get into your car, you will appreciate the different drive modes that are available for the Hyundai Veloster. Before driving, you can switch this vehicle into a mode that suits the weather or suits your mood.